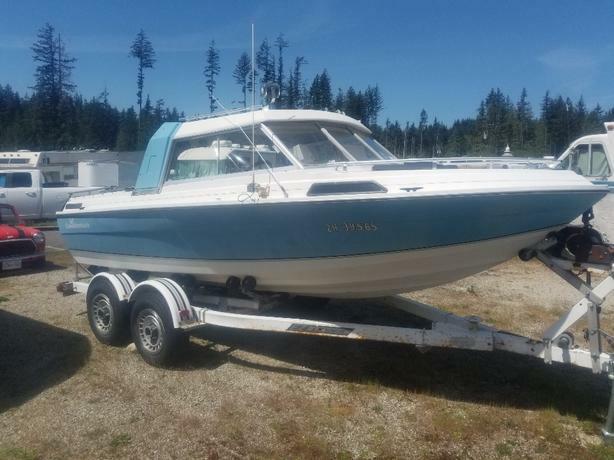 Bought this boat in 2017 in Alberta from near Slave Lake where it's been since it was new. It was built in 1993 and spent its life in a barn when not being used on the lake. I watched it run, then the seller took the batteries back out and I drove it to the Island when I came this way. The engine spins freely and everything is there except batteries, I never touched a thing. It's now been sitting since last summer and hasn't been run, not to say that it won't. It spins just fine and should go with some fresh fuel and batteries. It's probably the cleanest engine from the early 90's on the island considering it's never been put in salt water. It's very clear it's never seen salt just by looking at it. It's in such good shape I would be asking double this if I had the resources to run it. Comes with the tandem trailer. The papers are... somewhere... unfortunatley.. I'll see what I can do. I have a bill of sale for the hull from when I bought it and can provide one for the registration. Boat is currently in Sooke but with enough interest I might bring it out to Saanich. In the meantime I can set up viewings in Sooke. Might consider partial trades, try me anyways. Text call or email anytime.